Scott Russ Music sells, buys and rents quality new and used musical instruments. 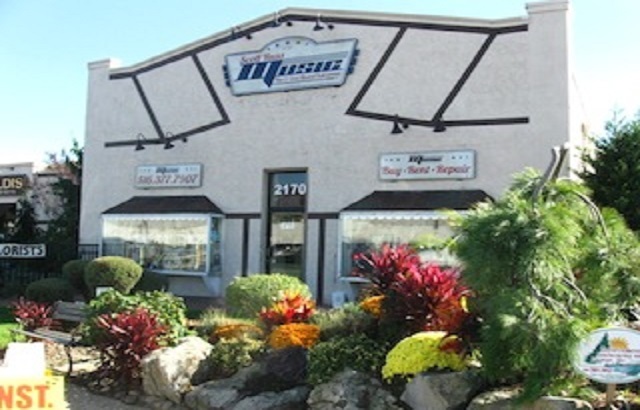 We perform expert repairs on site at our shop located in Merrick, NY. In addition, we are an authorized Hammond organ dealer as well as being an authorized dealer for Nord Keyboards, Leslie Speakers, Buffet Group, Kala, and Kurzweil Keyboards, among others. Our family has been in the music business since 1947. Owner Scott Russ, a former band leader, has been playing, repairing and working with instruments all of his life. We will beat any advertised price. Visit us at our store in Merrick or call us at 516-377-7907 with any questions and to arrange an appointment insuring personalized attention. Thank you Scott Russ and Bill over at Scott Russ Music! Bill, thanks for breathing some life back into my A 100 and 147's...have not sounded this good in while!! One of the last great Hammond tuners in the world. Made our 70 year old organ sound like new. Scott Russ Music helped restore my 1978 Martin D-35 to playability when the spruce top cracked and the neck went wrong. They are so helpful and skillful it makes my music work for me. Bought a vintage Hammond A100 and Leslie from a dealer who was unable to service the organ and speaker. With the help of Scott Russ and his very knowledgable tech, Bill, I now have an organ and speaker that makes me sound like a real professional organist. Bill and Scott bent over backwards to help me get the organ and speaker working perfectly. Thank you Bill and Scott for all your help and advice. You are a real God-send for me!! Scott was 'instrumental' in securing a back ordered Hammond Leslie Studio 12 just in time for our performance..highly recommend his services. Very nice guy helpful and knowledgable. The best! I ordered a xylophone it came the very next day in excellent condition including mallets, stand, and case and at a cheap price. Where to begin. I just started playing the cello a few days ago, and needed an instrument to practice with at home and to be mine... Scott is a total character, his family are all musicians and his father played alongside Duke Ellington (and there are pictures around the store which show it). I took the LIRR from manhattan to Long Island... Scott let me in and showed me around his incredible instrument warehouse. He had all the options for me set up, tuned and ready for me to play with, and taught me all about the features of the various cellos. They have an on staff luthier to hand-carve their bridges and sounding posts, and I was really impressed with the level of care they cleary took of their instruments. Add to that, they have a 3 year get half your money back deal, which is great for children and adults who may get bored. After buying a wonderful cello for maybe 1/3 of what I would have paid in the city, he drove me to the train station. Such a surreal yet amazing experience. I'm breaking in my cello already and its giving me some really amazing tone. Thanks Scott! Very well stocked, they really have EVERYTHING. the staff is also friendly, just be sure to call first to make sure they have what you want in stock. My son needed a french horn and a cello to take to college. I was having trouble finding instruments that were in my budget, yet of a high enough quality. I happened upon an ad in my local newspaper with prices that sounded too cheap to be real. I called him, expecting it to be a scam and was surprised with the depth of his music knowledge. Deciding this guy might be for real, I loaded my son in the car and we drove the 5 1/2 hours to his shop. He spent an hour and a half teaching us about horns and cellos and woods and metals and sound...It was well worth the 12 hour round trip drive! We got amazing instruments at a family friendly price! I have another son who is going to eventually need his own saxophone and I will definitely buy from Scott!